Blockchain is one of the key technologies in the continuing evolution of digital transformation. I have written about blockchain and followed its progression for more than three years, and I’ve seen the struggles ensue as this technology gets tossed around like a volleyball. I’ve come to the conclusion that the main issue is figuring out where blockchain plays in the digital transformation game. From my experience, most CIOs are not eager to add another technology to their stable, especially since integrating blockchain into legacy systems and processes can be a daunting endeavor. Despite that, many of these tech executives acknowledge that blockchain can resolve critical business challenges and provide benefits that have the potential to more than repay their efforts. One of these benefits involves trust: Blockchain brings trust and transparency to many critical applications — both financial and nonfinancial. But, ironically trust is also an issue when it comes to adoption, according to a new PwC survey. (More on the barriers below). One example that shows blockchain’s promise involves the new Boeing 787, which has 2.3 million parts that need to come together at the right time and the right place to ensure the plane gets built on time. About 600,000 parts are made outside the U.S., adding to the logistical problems. Blockchain could provide immediate transparency to the location, status and delivery schedule of every part, ensuring that this information is accurate, protected against fraud, and trustworthy. Another example is Amazon, which reportedly has 356 million stock keeping units (SKUs), while Walmart has only about 17 million SKUs. In both of these cases, blockchain could bring efficiencies in supplier purchasing, shipment, delivery, shelving, reshipping, store/customer delivery and payments. An additional benefit of using blockchain in these two cases is food safety. A substantial number of the Amazon and Walmart SKUs contain perishable food, which is subject to contamination from salmonella, listeria and E. coli. The CDC estimates that 48 million people get sick, 128,000 are hospitalized, and 3,000 die from foodborne illnesses each year in the U.S. In addition, these illnesses cost business about $55.5 billion, according to Fortune. Tracking perishable products is a complex process, but the benefits are critical to the life and health of customers — and to the financial health of retailers. Blockchain can enhance food safety in these situations by monitoring and tracking the supply chain. It also can provide compliance with the FDA Food Safety Modernization Act (FSMA) and other consumer protections. Since I first wrote about blockchain’s progress, I’ve become convinced that the technology’s adoption has been far too slow. Here’s one reason: In my work with CIOs and large IT organizations, I see more stress and pressure than ever before, as the number of issues facing IT is growing faster than organizations can handle. Consider some of the key challenges on the CIO's list of biggest issues: the Internet of Things (IoT), upgrading legacy systems, the skills gap, in/outsourcing, cloud migration and cybersecurity, as well as enormous budget pressures. Adding blockchain compounds these problems, which is delaying adoption. 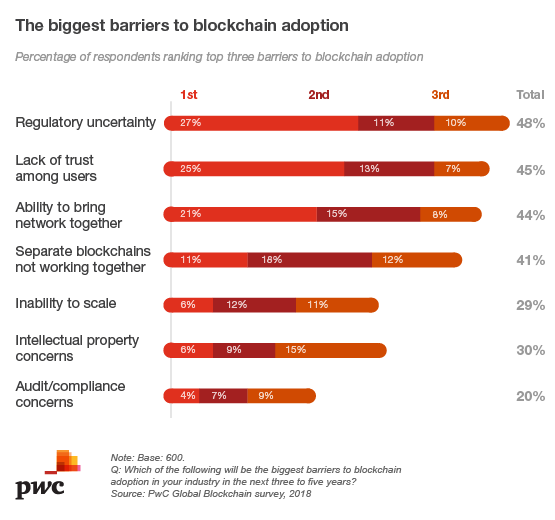 Though the goal of blockchain is to build trust, 45% of PwC survey participants said that lack of trust among users is the second biggest obstacle to adoption. (Regulatory uncertainty is the top barrier.) Individuals may question blockchain’s reliability, speed, security, standardization, scalability or lack of interoperability with other blockchains. Part of the trust problem is caused by a lack of understanding, as many executives are unclear about what this technology — which is abstract, technical and happening behind the scenes — actually is. The second blockchain challenge is actually building the network, which requires getting buy-in, harmonizing data, and agreeing on — and enforcing — rules and standards. Organizations must also consider scalability issues and integration with existing IT systems. Though building a company blockchain can be challenging, building a blockchain ecosystem requires a whole new level of effort. The technology’s value is highest when different industry participants develop a shared network, but the third parties in such ecosystems must all agree on the rules and standards — and that’s not an easy thing to achieve. What may be even harder is getting the blockchain partners to trust one another. 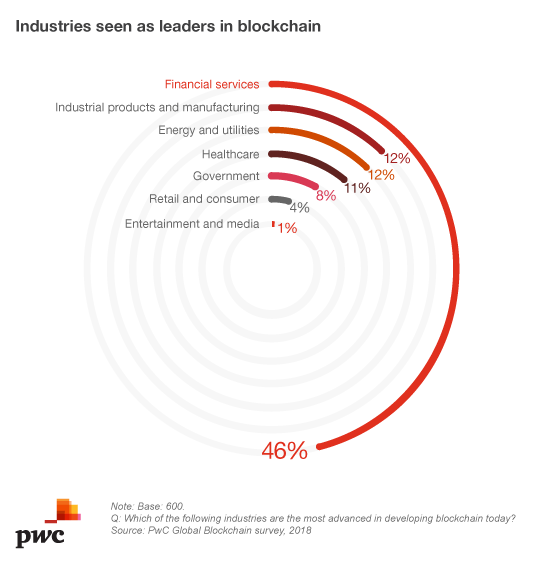 The PwC survey includes a hypothetical example of a multinational business that builds a blockchain to manage an intercompany process, such as transfer pricing or treasury management. The company has to manage multiple ERP systems, as well as a central ledger for each of its subsidiaries. It also has to deal with inconsistent data and processes. Blockchain can solve those problems by creating a single distributed ledger that eliminates the need for reconciliation. It replaces bank transfers, currency conversions and numerous emails with a tokenized transfer that takes place in near real time with the use of smart contracts. Blockchain also enables the various users to track the progression of each transaction, verifying accuracy and building trust. Looking at real-life examples, one innovator in the blockchain space that has deployed large-scale implementations is Context Labs and its climate/impact-focused subsidiary, Spherical|Analytics. The company views blockchain as a means to instill trust in a decentralized world — but not just with technology. "The Context Labs efforts combine our technology with a method to help align decentralized ecosystem members with a common level of interoperability with examples in the global music sector, Open Music Initiative, and global automotive transportation, MOBI (the Mobility Open Blockchain Initiative)," stated Dan Harple, CEO of Context Labs. "Building a common layer of trust in a decentralized supply chain ecosystem requires an open protocol/API that allows the members to seamlessly share relevant data in a trusted way — regardless of the blockchain fabric — that's been a key differentiator for Context Labs." Another key player in the blockchain market is Hyperledger, an open-source collaborative effort created to advance cross-industry blockchain technologies. This global collaboration, hosted by The Linux Foundation, includes leaders in finance, banking, IoT, supply chain, manufacturing, and technology. Hyperledger is another good example of how a technology forum can bring together startups, innovators, invention, providers, and others to provide common ground that can help a new technology like blockchain flourish. As a growing number of companies build blockchains, they will come to understand that the real benefits of this technology are greater trust and transparency in business processes, connections, and global networks. In addition, blockchain may also open up significant new — and as yet unknown — business opportunities..
PwC Survey: Blockchain is here. What’s your next move?